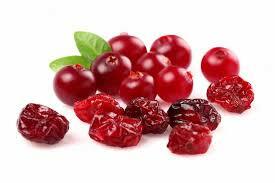 Cranberry is one of Nature′s best weapons against cystitis and urinary tract infections. It has helped to treat bladder and kidney infections and has also helped to dissolve kidney and gallstones. Moreover, it is said to possess antioxidant qualities that may protect against the invasion of serious malignant disease. Cranberry is native to North America, and for hundreds of years, Cranberries have been used to promote urinary tract health. They contain substances which alter the bacteria population in urine, and these substances seem to make harmful bacteria less likely to cling to the surface of cells in the urinary tract. Cranberry appears to inhibit the adhesion of bacteria (often E. coli) to the urinary tract, perhaps due to a polymer contained in the plant, and this action allows the harmful bacteria to be eliminated. The benzoic acid content in the berries works as a natural preservative. Cranberry is believed to be effective in inhibiting the formation of kidney stones and "bladder gravel," as well as to removing toxins from the blood. Cranberry has long been recommended for persons with recurrent urinary tract infections (UTIs), and is thought to not only prevent urinary tract infections, but also to eliminate odors associated with incontinence. Other suggested benefits for the use of Cranberry are to reduce inflammation and pain and to help improve digestion. The Cranberry, is a diuretic and urinary antiseptic that helps prevent the spread of bacterial infection in the urinary tract. Studies (conducted in the mid 1990s) revealed that Cranberry′s effectiveness is not due to its ability to acidify the urine as originally thought, but to its ability to prevent E. coli from adhering to the cells lining the wall of the bladder. Without adhering to the bladder, E. coli cannot flourish, and test tube studies also suggest that Cranberry may also inhibit the adherence of other species of organisms that cause urinary tract infections as well, such as Proteus, Klebsiella and Pseudomonas. In fact, Cranberry prevents bacteria from sticking to the wall of the bladder, thus flushing the potential troublemakers out of the body before they do damage. Studies also suggest that Cranberries may help to prevent bacteria from adhering to gums and around the teeth, which may be very beneficial in the area of oral hygiene. Cranberry is high in antioxidants, partly from substances called proanthocyanidins (which give cranberries their rich color). Antioxidants scavenge damaging particles in the body known as free radicals, the natural by-products of normal metabolism. Free radicals can alter cell membranes, tamper with genetic material known as DNA and even cause cell death. Environmental toxins (including ultraviolet light, radiation, cigarette smoking and air pollution) can increase the number of free radicals in the body, which are believed to contribute to the ageing process as well as the development of a number of health problems, such as heart disease, melanoma and infections. Antioxidants can neutralize free radicals and may reduce or even help prevent some of the damage they cause. While Cranberry is known for killing the bacteria that cause kidney and bladder infections, it is also helpful in dissolving kidney stones and gallstones. Kidney stones are most often caused by high levels of ionized calcium (as in calcium salts) in the urine, and Cranberries can help prevent this condition because they are rich in quinic acid, which increases the acidity of the urine. As a result, the levels of ionized calcium in the urine are lowered. The Cranberry plant has been in existence since the Iron Age, but the Romans were the first to recognize and document its medicinal uses by the local inhabitants of what is now England. Herbalist Henry Lyte documented its healing effects in 1578, and since that time, the Cranberry has been a popular folk remedy for a variety of illnesses, including gout, rheumatism, diarrhea, constipation, scurvy, fevers and skin problems. The Cranberry plant is a small, creeping shrub bearing beautiful pink flowers that grow into rounded reddish-black berries, which are closely allied to the blueberry and huckleberry. Early Native Americans introduced Cranberry to the Pilgrims who settled the New England area, and the berries were favorably mentioned in a written European Account of Two Voyages to New England During the Years 1638, 1663 by John Josselyn. Currently, there are approximately 150 species of Cranberry , but the best known and most popular is the American Cranberry (Vaccinium macrocarpon) , because of the size and juiciness of its fruit. 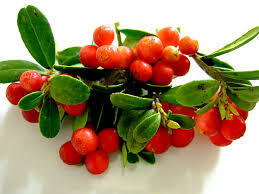 The colonists "Europeanized" the berry, using it stewed and sweetened in puddings and tarts, and the Europeans included the Cranberry regularly in their diets and considered it a fine treatment for scurvy (it has a very high vitamin C content). Cranberry was cultivated by Captain Hall of Massachusetts in 1820, and by Benjamin Thomas of New Jersey about 1835. The berries are harvested early in the autumn for commercial preparation, but it is a difficult plant to grow, requiring a heavy investment and bogs. Some of Cranberry′s chemical constituents include tannins, lutein, triterpenoids, anthocyanins and catechin. It is also a good source of protein, fiber, beta-carotene, citric and malic acid, calcium, folate, iron, magnesium, manganese, phosphorus, potassium, selenium, sulfur, zinc and vitamins A, B-1, B-2, B-3, B-5, C and E.